It was a grey and hazy morning in North Devon as we hunted for rainy day activities to occupy the kids. We set off for Ilfracombe Aquarium in the hope of a couple of hours’ entertainment, finding somewhere for lunch and a spot of spontaneity from there. We also set off in long sleeve tops. Sun hats and SPF begrudgingly but acceptingly left behind. The weather forecast over an entire week turned out to rarely be accurate. But this is a UK summer holiday – we should have known better! North Devon with its undulating physical geography seems non-compliant with the meteorologists. Within the 20 minute drive from our base in Braunton to this surprisingly expansive and beautiful Victorian town, the clouds were rolling on by. And after the 20 minutes or so that the aquarium occupied our two, we walked out into baking June sunshine at the seaside. Yes, we’d have been a bit stuffed otherwise! 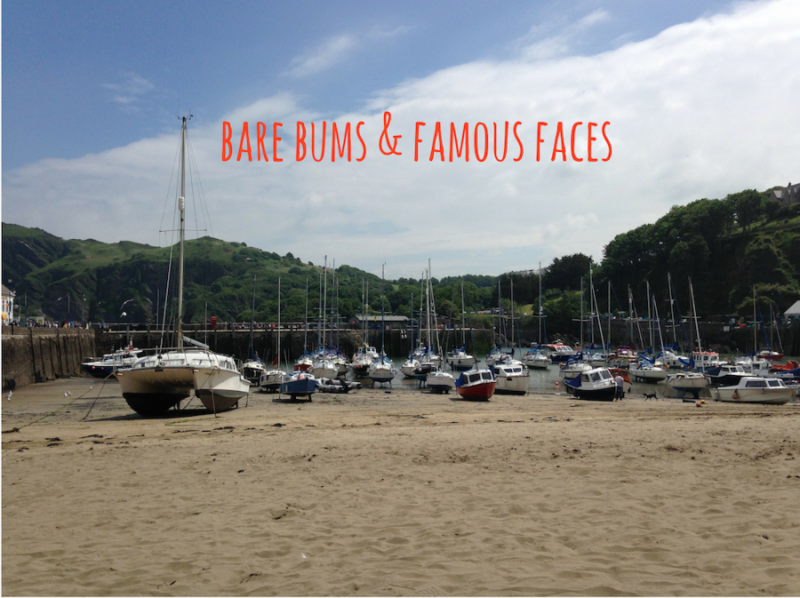 Ilfracombe is all lush countryside, rolling hills and miles and miles of Victorian architecture – grand Victorian villas, shop fronts and tea rooms. The town’s pleasure garden stirs imaginations of graceful afternoon wanderings except that it’s actually quite hilly and presumably therefore was rather arduous for ladies in Victorian dress once upon a time. It’s proud of its Victorian heritage too and enjoys an annual Victorian Celebration week each June – as we discovered. We took more than a handful of double takes as we passed ladies in elegant long dresses with parasols and men in morning suits and top hats. They looked particularly out of place on the zebra crossing. And if it’s crazy golf and amusement arcades that are embedded in your childhood memories of seaside holidays you won’t be disappointed either. This unassuming Victorian seaside town that’s so reliant on tourism has one very well known patron who, in his own way, is contributing to the appeal of the place. If you drive all the way to the quayside and park by the aquarium you’re greeted by the pert and oversized bare bottom of Verity. This steel and bronze structure towering over the harbour with pride and confidence tells another story as you walk around the sea wall to discover its frontage. As controversial as you might imagine this sculpture to be amongst the local community, it certainly draws a lingering crowd – some of whom, we’re guessing, wouldn’t be seen dead in an art gallery. But we couldn’t help thinking what a random place this sleepy seaside town was for such a modern art installation. Then we stumbled across an unassuming, yet out of place, modern art gallery amongst the quayside cafes and ice cream parlours. other criteria is Damien Hirst’s gallery (he also owns the wine bar next door). Verity is his creative work too. Turns out that one of Britain’s most celebrated modern artists lives down the road in Combe Martin. The aquarium is thoughtfully planned taking visitors from the river via the estuary to the sea meeting the water residents of each along the way. There are prawns, starfish, spider crabs and baby rays alongside minnows, bream and a shy lobster. It’s just not that big. But there are stickers and which pre-school age kid doesn’t love a sticker. There is a cafe though, some of it under cover and part of it on a little balcony overlooking the harbour under the beam of midday sun – should it show its face. It’s a simple menu of sandwiches, cake, coffees and milkshakes. But why do you need anything else – one of the best sarnies we’d had in ages, I’d say. The stuffed cheeks and empty plates suggested everyone was in agreement. Although I’m realistic that it probably won’t last, my 3 year old’s enthusiasm to “climb the mountain to see the church” stirred a hopeful delight that my own curiosity of historic sites might be somewhere embedded in his genes. And despite leaving the climb to the end of the day, the Grand Old Duke of York would have been proud of how enthusiastically he marched all the way to the top of the hill. Atop is St Nicholas Chapel, which also acts as Ilfracombe lighthouse. But it was once home to a couple who had a lot of children and that’s where the mind starts to boggle, because there’s no running water and it’s a long way down. Get your heart rate up. Fascinate at the prospect of Victorian life up here with a mini entourage stretching into double figures. Remember health and safety is a very modern creation and then enjoy the view across to Tenby. Ilfracombe beach is there when the tide is out and it becomes a mooring harbour when the tide is in. But that also means that this petite beach contained within the harbour walls is sheltered from coastal breezes that bluster into other local beaches like Saunton. No, there’s no rockpooling or body boarding available here, but variety’s the spice of life. Right? Its position also means you’re close to loos, lunch and ice cream. And perhaps most excitedly for young boys an enormous RNLI lifeboat. Fireman Sam eat your heart out. The sunshine definitely helped us explore Ilfracombe as much as we did, but it’s a beautiful spot come rain or shine and so different to the typical British seaside day trip. So much like Scarborough, don’t discount it. The Victorian’s built a beautiful town, go see for yourself.